TENS Of Thousands Of Homes Across Victoria Without Power As System Buckles Under Heat – Welcome To Your Wind Powered Future! MORE than 437,000 [Climatism correction. See below ‘Update’] homes across Victoria are without power. The number has skyrocketed since about 6.15pm amid oppressive heat and humidity. The tally just before 9pm stood at 37,585, which included Citipower, Powercor and United customers, plus figures from AusNet. Melbourne’s west has been hit hard, with homes in Sunshine, Seddon, St Albans and Altona North affected. The outages stretch from Truganina and Hoppers Crossing down to the suburbs surrounding inner Geelong. The Bellarine Peninsula is one of the hardest hit by outages, with more than 15,000 households in the beachside towns of Ocean Grove, St Leonards, Indented Head, Point Lonsdale and Queenscliff left sweating in the heat. A Citipower spokeswoman said 35,000 customers across the supplier’s three networks were without power as of 8pm. Memo to government. It’s your responsibility to provide basic services like energy to households who pay heavily for it. On days like today pedal power ain’t going to cut it. Quite right-Power came back on for 1.5hrs in Bellarine last night. Bet that was just enough to boost fridges to avoid food spoilage claims. “Most of the problems today have been fuses blowing basically because of hot weather and very high demand,” the spokesman said. Tom Koutsantonis reckons his state’s wind farms were delivering the goods for South Australians and Victorians, as well. So, always ready to rain on Kouta’s parade, let’s drill down a little closer to see what SA’s whirling wonders were actually doing on 18 and 19 January (when South Australians needed power most). 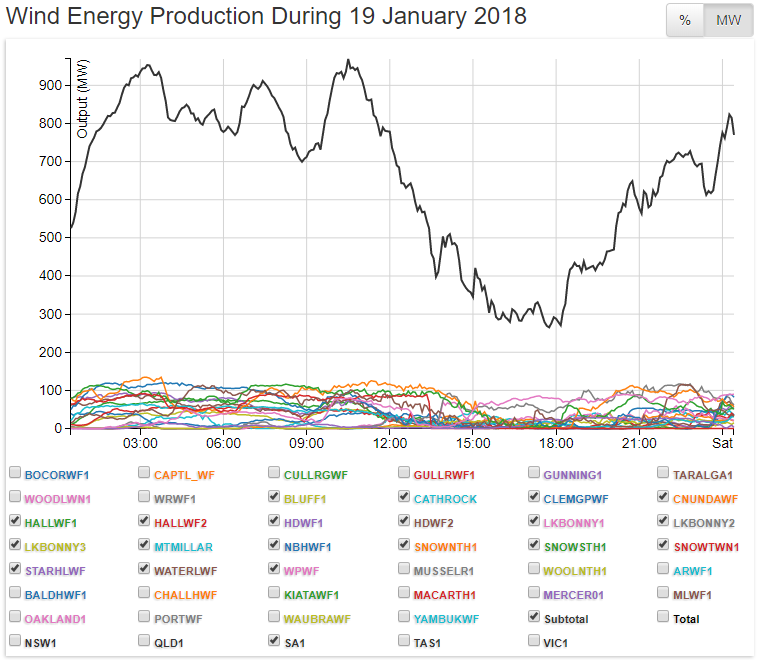 Looking more like the profile of a terrifying Swiss ski run, that’s the entire output from SA’s wind farms on 18 January. Thereafter, output collapses 650 MW – from 700MW to 50 MW – over the course of the afternoon; precisely as demand for power peaked. Weatherill, Koutsantonis and their wind worshipping cronies keep pointing to his $150 million mega-battery as some kind of miraculous saviour. Maths is clearly not among their strongest points. 100 MW (the notional capacity of the battery) fits five times into the margin of the first collapse, and 6½ times into the final post-lunch collapse on 18 January. 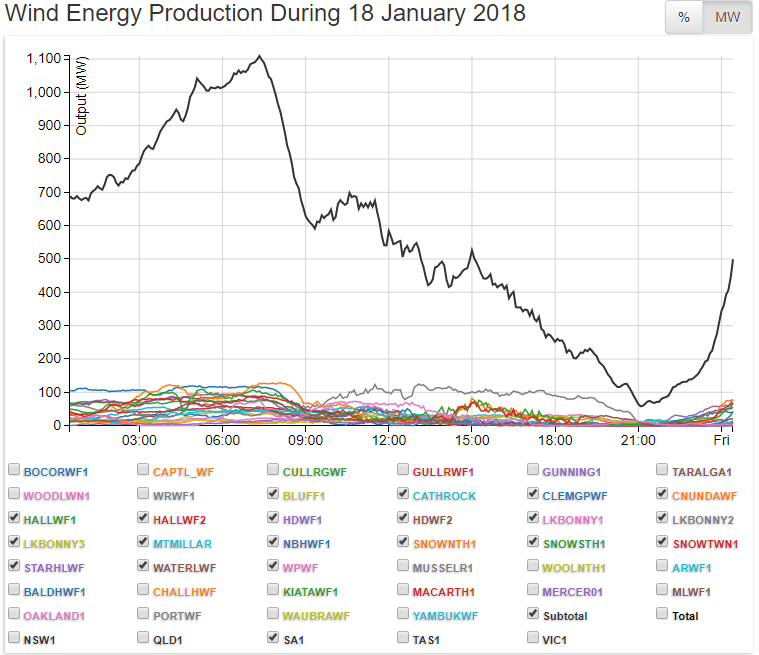 Having put in an almost respectable effort before morning tea – topping out at 1,000 MW – again, as the day warmed up and power demand surged, output plummets: a full 700 MW – from 1,000 MW to 300 MW – by mid-afternoon, where it bobbed along until 6pm. At $150 million to get 100 MW worth of Tesla’s battery storage (said by its boosters to deliver 129 MWh), the cost of tooling up to accommodate 700-1,000 MW wind power output collapses every other day would pretty soon add up to $billions. As pointed out by The Australian, the yawning gaps in SA’s wind power output weren’t back-filled by wind power lovingly stored in Musk’s Marvel, but by the trusty and reliable coal-fired plants still merrily chugging away in Victoria’s Latrobe Valley. But that fact wouldn’t fit their narrative now, would it? With a deranged and delusional leadership in charge, South Australians can look forward to rocketing power prices and rolling blackouts for years to come. 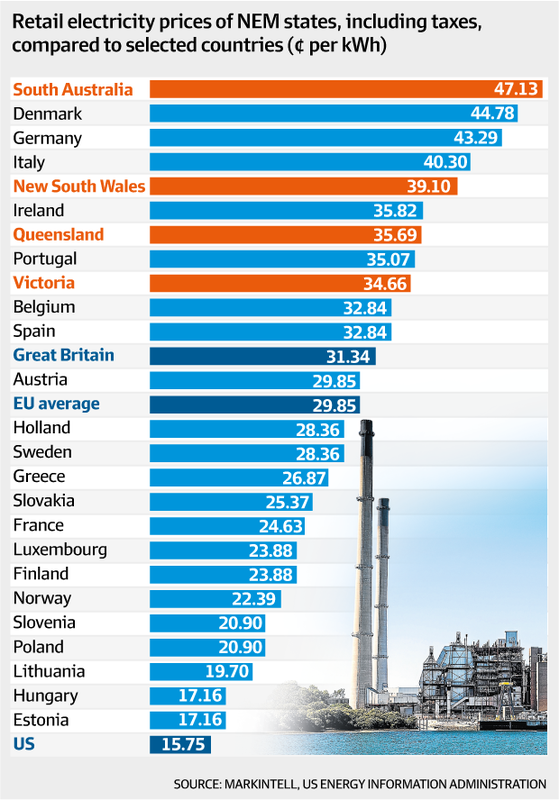 EXPECT more skyrocketing electricity prices, blackouts and load-shedding as Australia’s virtue-signalling, climate theory-obsessed politicians continue their jihad against what was Australia’s once proud boast – cheap, reliable, efficient baseload power. 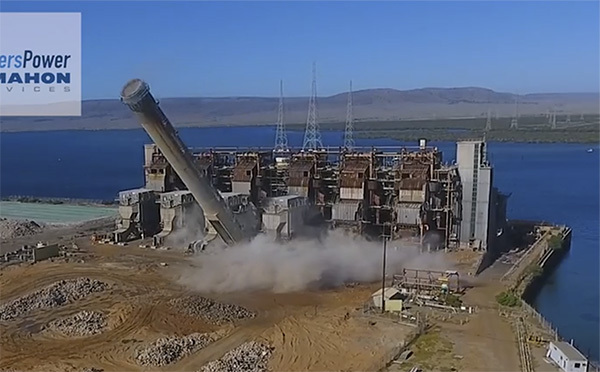 Today the South Australian government destroyed the smoke stack of the Playford B Plant, one more part of what’s left of the cheapest base-load electricity generators in the state. For about $8 million a year over three years, they could have kept some coal power going and wouldn’t have needed to spend $400 million on emergency diesel generators they don’t want to use, and over $100 million on a battery that can supply 4% of the state for one hour. They also would’ve paid less than $120 million for two days of electricity last week. On the upside, they can feel good and pretend to be “world leaders”. Virtue signalling is expensive, eh? The plant employed 185 people, the coal mine 200. Other businesses in the town, who knows? People are leaving. SA, a star in the race away from being a competitive, powerhouse rich state. Creating wealth and jobs in China. The concrete and brick structure at the 240MW Playford B power station, named after long-serving South Australian premier Sir Thomas Playford and mothballed in 2012, leaves only the 200-metre high stack at the nearby Northern power station standing in Port Augusta, 280km north of Adelaide. That is expected to be demolished in April or May as part of a decommissioning process undertaken by Flinders Power, an offshoot of former power station operator Alinta Energy. Before announcing the closure of Northern in mid-2015, Alinta unsuccessfully sought $25 million in subsidies over three years from the South Australian Labor government to keep it operating until this year, to ensure an effective transition occurred, after a rapid rise in renewable energy made it unviable. However, the Weatherill government, which is ideologically opposed to coal, rejected the offer. Deirdre McKerlie, who works at KD’s Hair Flair, told The Australian that not having a transition plan was “just stupid”. She said Port Augusta hit “rock bottom”, with many businesses unviable and residents moving away. The boilers were blown up in November. The rest will be demolished in April or May. SA, living standards thereafter. SA had two coal power plants: Playford B, built in 1963, 240MW and newer Northern Power Station (1985) and 520MW. This ETSA PR film from 1954 may be of interest. Shows the opening of Playford A power station, the first of three powered by Lee Creek coal. Tom Playford himself appears briefly in the film. A brief history of the complex is here. Melbourne: 42,000 homes in dark, no fans left at Kmart. Power outages due to “secret” air conditioners? The temperature reached 38C in Melbourne (100F) on Sunday — something it has probably done most summers since 10,000BC. “The extreme heat has significantly increased electricity use and this has resulted in localised power outages,” Ms Tyner said. Who knew you needed to tell your power company when you put in an air conditioner? Gone are the days when people could willy-nilly run down to Retrovision and just buy an air con. If only the same people would say that about hot days. You know things are serious when Kmart runs out of fans. A Kmart in Northcote on Sunday was completely sold out of all cooling devices, from fans to air-conditioning units, its duty manager said. So no willy-nilly fan buying either. Tonight some people have fans, but no electricity. Others have electricity but no fans. Others have electricity and fans, but no money. Luckily electricity “only” reached a peak of $3,125 per MWh briefly in Victoria. (Only a few million extra). Welcome to Australia’s deadly game of Melbourne and Sydney blackout roulette. The stakes involve hundreds of millions of dollars of refrigerated food and the operations of thousands of factories and offices who don’t have emergency power contingencies in place. …Victoria took longer than NSW to wake up but it too has been working hard to reduce the risk of blackouts. For the most part, both states are borrowing ideas from third world countries by getting industry and consumers to cut back on power usage when days are hot. In addition, those organisations with back up power (like phone companies) are being asked to use it so as to cut demand and, if possible, put power back into the grid. Accordingly, highly polluting diesel becomes the saviour. Could someone teach editors what “record-breaking” means? Last night the minimum was 22.8C in Melbourne. Tonight was forecast to be 28C. If the Bureau are right, it won’t be close to breaking the record. While it is not quite a record, Melbourne has come close to the hottest-ever January overnight temperature of 30.6 degrees. Melbourne has reached that record twice since records began, once in 1902 and again in 2010. The good news is that the other 1.5 million homes still have electricity. Though the United Energy Outage Map keeps going out itself. The Ausnet Outage Map has a popup note: due to the large number of outages power may not get restored til Monday morning. THE amount of homes affected by the latest Victorian blackouts varies wildly from news org to news org. The original Herald Sun article which this post is based reported “MORE than 437,000 homes across Victoria are without power.” The article has been updated and overwritten.